24 • SHOPPING CENTER BUSINESS • May 2017 NEWSLINE MID-AMERICA ARRANGES SALE OF SHELBY CORNERS SHOPPING CENTER IN METRO DETROIT Mid-America Real Estate Corp. has arranged the sale of Shelby Corners in Utica, Michigan, a suburb of Detroit. The sales price was not disclosed. The 76,390-square-foot shopping center is located at the northwest corner of Hall and Schoenherr roads. Tenants include Christmas Tree Shops and BuyBuy Baby, both subsidiaries of Bed Bath & Beyond. Michigan-based Grand Management & Development purchased the property. Ben Wineman, Carly Gallagher and Daniel Stern of Mid-America brokered the transaction. FEDERAL REALTY ACQUIRES RIVERPOINT CENTER IN CHICAGO'S LINCOLN PARK FOR $107 MILLION Federal Realty Investment Trust has acquired Riverpoint Center in Chicago's Lincoln Park for $107 million. The 211,000-square-foot, grocery-anchored shopping center sits on 17 acres at the corner of West Fullerton and North Clybourn avenues. Riverpoint Center is currently 97 percent occupied and is anchored by Jewel-Osco, Marshalls and Old Navy. 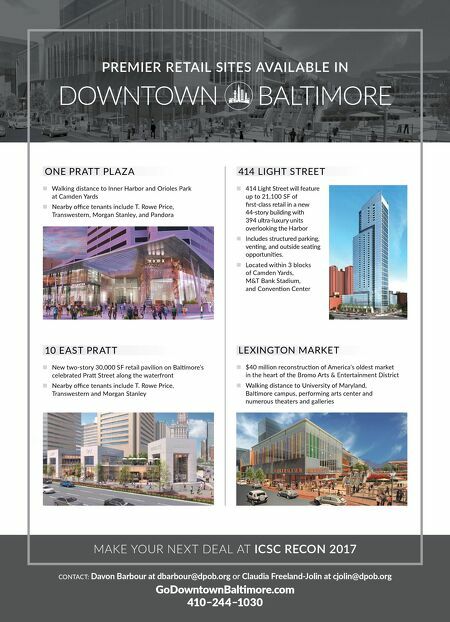 Federal Realty anticipates increasing the value of the property over time through the re-leasing of space currently leased at below market rents and the potential to increase density at the infill site. CYPRESS EQUITIES SELLS EIGHT WALMART NEIGHBORHOOD MARKET PROPERTIES Dallas-based Cypress Equities has sold eight Walmart Neighborhood Market properties located in Alabama and South Carolina to an undisclosed U.S.-based REIT. 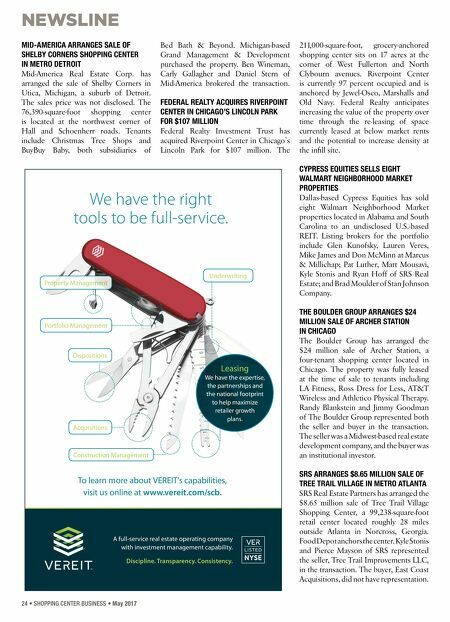 Listing brokers for the portfolio include Glen Kunofsky, Lauren Veres, Mike James and Don McMinn at Marcus & Millichap; Pat Luther, Matt Mousavi, Kyle Stonis and Ryan Hoff of SRS Real Estate; and Brad Moulder of Stan Johnson Company. THE BOULDER GROUP ARRANGES $24 MILLION SALE OF ARCHER STATION IN CHICAGO The Boulder Group has arranged the $24 million sale of Archer Station, a four-tenant shopping center located in Chicago. The property was fully leased at the time of sale to tenants including LA Fitness, Ross Dress for Less, AT&T Wireless and Athletico Physical Therapy. Randy Blankstein and Jimmy Goodman of The Boulder Group represented both the seller and buyer in the transaction. The seller was a Midwest-based real estate development company, and the buyer was an institutional investor. SRS ARRANGES $8.65 MILLION SALE OF TREE TRAIL VILLAGE IN METRO ATLANTA SRS Real Estate Partners has arranged the $8.65 million sale of Tree Trail Village Shopping Center, a 99,238-square-foot retail center located roughly 28 miles outside Atlanta in Norcross, Georgia. Food Depot anchors the center. Kyle Stonis and Pierce Mayson of SRS represented the seller, Tree Trail Improvements LLC, in the transaction. The buyer, East Coast Acquisitions, did not have representation. To learn more about VEREIT's capabilities, visit us online at www.vereit.com/scb. We have the right tools to be full-service. Construction Management Acquisitions Acquisitions iting Underwriting Dispositions Property Management Portfolio Management A full-service real estate operating company with investment management capability. Discipline. Transparency. Consistency. Leasing We have the expertise, the partnerships and the national footprint to help maximize retailer growth plans.